The Journey Up My Family Tree: More details, please! I began this blog as a way to describe in some detail how I climbed the branches to my own family tree. 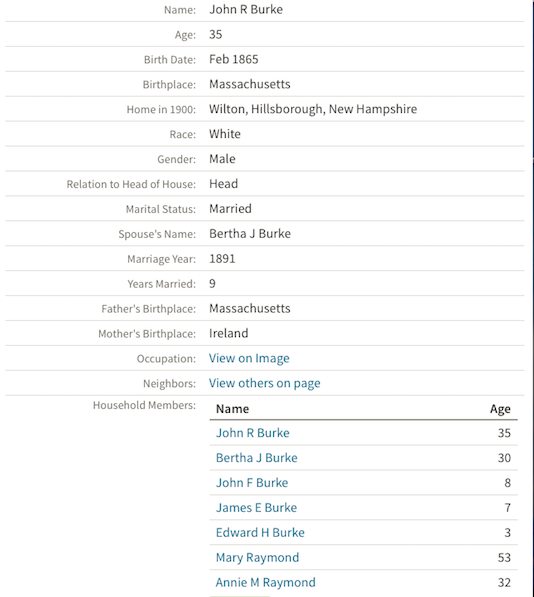 So far, I have not done such a good job in the "some detail" department, so I will remedy that now as I describe how I hope to learn the middle name of the person I think is my <3rd?> great-grandfather, JOHN J BURKE in my tree. In case you have not read my previous posts - and you should - I learned many facts that conflicted mightily with what I thought I knew growing up. For example, whereas I thought all four of my grandparents were early-1900's immigrants, I quickly learned that was not at all true. My maternal grandfather, JOHN FRANCIS BURKE, was a native-born Wilton, NH, citizen, and his wife, my maternal grandmother, NINA LILLIAN THOMPSON, was a native-born Canadian. Both do appear to have their roots in Ireland. My first step in any new clue is to investigate United States Census reports, if any. These are generally reliable sources of information as long as one understands the limitations that might exist because of name spelling, house occupants, census taker's penmanship, and legibility of the online document itself. As an aside, recall that I use Ancestry.com as my primary source, though there are many others, and I am not compensated in any way by them for using their databases; I pay for it all. When I am there, however, I do not use other subscribers' trees and rarely follow those 'shaking leaf' clues because I have found them to be inaccurate and often full of information or merely copied from someone else's tree...often mine...and not verified. I have, however, found a few reliable member sources online; in fact, there are three with whom I share information and clues pretty regularly, but I prefer making my own judgements about those clues. Digging a little deeper into the actual census record itself, I learned more about those names. The census report contains clues to help validate or fill in gaps in the information, like birthplace of the individual being recorded, marriage year, if any, years married, father's and mother's birthplace (particularly critical for early immigrants), citizenship for those not native-born, and home in the year of the census (1900). Neighbors shown in the census report can be a good source of validation, so I look there, too. Using the three photos, I validated that JOHN R BURKE is my 2nd great-grandfather, that Mary Raymond matches the relative found elsewhere in my family tree, and since the name was not familiar to me before, it added ANNIE M RAYMOND to my search. From here, I slowly and steadily make steps up my tree, validating information and following new name-clues as I go. I am still looking for validation of my 3rd great-grandfather because I do not know his middle name; that is the brick wall I have encountered on this side of the tree. But you know what? It does not diminish my excitement or the fun of the search. That is what genealogy is all about!